Submissions for Chapter 2 of "The Tale of the Haunted Muskie" are due by 8 p.m. Sunday (500 words or less and appropriate for young readers). One entry will be selected as the "official" second chapter in this first Daddy-O Write a Children's Scary Story event. However, I'd love to publish more of them on the blog. Email your writing to jeremy.olson@startribune.com. I'll be seeking third and fourth chapters of the serial ghost story this month, with publication of the full tale Monday, Oct. 31. Have fun with the writing, and advance the narrative well beyond the scene in Chapter 1 (below). We've only got four short chapters to scare our readers, after all! By the way, if you haven't ever seen it, there really is a giant Muskie in Nevis, Minn. It's so famous that it has its own Facebook page. A little history regarding the 60+ year old roadside novelty can be found here. Once every October, Charlie Jackson’s family drove north to an old smelly cabin on Lake Belle Taine. There was something very familiar – very boring – about the trip. It usually followed the fourth or fifth call from Charlie’s principal. This time, Charlie’s mom and dad were so fed up, they barely let him talk the whole four-hour drive. His mom, Wendy, didn’t respond. The only noise was the muffled music from his big sister’s headphones. “Another classic story from the bone-brain,” Lisa shouted. The car rolled into the town of Nevis, like it did every year. His father, Bill, started walking into the local gas station, like he did every year. But then he turned around, like he did every year. Nevis was boring for a 10 year old like Charlie – well, almost boring. 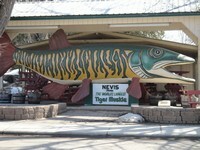 Across the street from the gas station was a giant fish – the Nevis Tiger Muskie. Charlie climbed inside its gaping mouth when he was six, only to hit his head and need stitches. He climbed on top of it when he was eight, then slipped off and sprained his right arm. With his parents out of sight, Charlie got out of the car and walked across the road to stare at the great and mysterious plastic fish. Something wasn’t right. He squinted. The fish’s bulging eyes were narrower – meaner. It wasn’t in the right place either. Charlie knew the fish was supposed to be two steps from the closest picnic table, because that was how he jumped on top of the fish. The picnic table hadn’t moved, but the fish was four, five steps away at least. Charlie looked around the town. Had anyone noticed? Across the street, an old man was staring out a storefront window. At the gas station, two teenagers were giggling. Inside the car, his sister hadn’t even noticed he was gone. Charlie whirled back around at the Muskie. What was that?! Had it just winked? Nooooooo. The fall wind whipped in from the lake at the edge of town. Charlie shivered.